I never heard anything about the Swiss Enigmatik so far, so I was very positively surprised when I heard “Forgotten Memories” for the first time. Enigmatik play a very own, a very special and a progressive way of Black Metal. They have lots of influences, from Swedish and Melodic Death Metal to Thrash and of course every kind of Black Metal. It’s this variability which makes Enigmatik’s first full-length album after two demos (one maxi and one MCD) so special and so fresh for the Extreme Metal scene, because I think the quartet created something which is really new and original. This begins with the vocals of Hysgarth: he is able to scream really evil, he growls like a Death Metal shouter and he’s also able to sing clean in a hymnic and majestic way. And of course the rest of the band doesn’t stand behind and I think they’re all good and experienced musicians. Some words to the production, which is very successful, you can easyly listen to every instrument, and this is important for an ambitious album like this. Enigmatik show an enormous potential on “Forgotten Memories” and I think an analysis of the songs makes sense in this case, because everyone is a little epos. Past Time Spirit - There’s no intro, the song goes straight ahead from the first second, there’s blastbeat everywhere. Already here, you can see the variability, because there are midtempo passages, unconventional stop-and-go drumming, some heavy, dragging parts and Hysgarth changes his vocals between Black and Death Metal and also sings some clean verses, which sound very Viking-like. These five and a half minutes are very intensive, and Past Time Spirit is an optimal start. Beyond The Black Gate - The second song starts with acoustic guitars, before it goes into uptempo with unleashed screaming. The guitars are very heavy, and there are some great band parts at the beginning, and also here is the vocal change between the different styles. It’s not difficult to remark that Enigmatik have lots of influences, and the end of the song, which is absolutely Melodic Death, fits perfectly. Solaris - This is mostly a pure Death Metal song, which sometimes reminds of the new Mystic Circle. Most of the time in midtempo, there are some cool lead guitars and in the middle of the song, Solaris turns into a Black/ Death pearl. A very good detail is the roaring bass, and the song ends slowly and with blacky, despaired screams. The Wanderer’s Song (Instrumental) - Now we come to the most extraordinary song of “Forgotten Memories”. The Wanderer’s Song is an instrumental, but not a normal one, there are just acoustic guitars and some percussions at the end. The song spreads a melancholic and dramatic flair and is very original. Or have you ever heard Black Metal riffs on acoustic guitar? Me neither. Indeed a good breather. Buried In The Labyrinth - This is raw and harsh Black Metal, with freezing, Nordic guitars. Most of the time in blasting tempo, there is a melodic part with cool thrashy guitars in the middle, and of course the hymnic clean vocals don’t miss, and here they are in two voices! At the end, Buried In The Labyrinth first calms down, but then there’s again pure blasting. Great! Sovereign - The shortest song of the album. It starts in heavy midtempo, then it has again this great stop-and-go drumming, later on lots of bangy riffs, sometimes Melodic Death Metal-like, sometimes reminding of Slayer. Short but effective! Fallen Halls - Again we can listen to the great change between Black Metal and clean vocals, which accompany the solemn start of Fallen Halls. Of course the song is also very varied, and the best things are some lead guitars which sound a bit like Marduk. A classic, melodic guitar solo closes Fallen Halls. The Unleashed Ones - This is the longest song on “Forgotten Memories”, it’s a real hymn. It shows all things which mark Enigmatik: tempo-changing, different vocal style, good songwriting and the best chorus (with a clean voice) on the whole album. There are also some feepy guitars, and the end is very melodic, hymnic, with a good guitar solo and just the perfect end of a really great album. As last words, I can only say: listen to Enigmatik, they really deserve it! “Forgotten Memories” is one of the best Extreme Metal albums of the year. A big compliment for that! After two demo cds, a single and a mini cd, ENIGMATIK present us their first longplay record named “Forgotten memories”. After listening to this piece for several times, I may say, their work is really well done! The music of “Forgotten memories” isn’t made to reveal its whole power and concept after the first superficial listening. At first the eight compositions may seem a little bit too complicated, but after a few times, this cd reveals its whole depth. 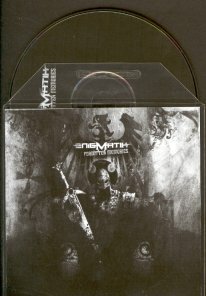 The music of ENIGMATIK is a mix of many styles. They achieve to put together in a song black metal, death metal, progressive and epic elements. The vocals go from deepest grunts to coldest black metal shouts, and many times the listener will find also clean vocals like Bathory from “Hammerheart” times. The lyrics reveal visions of the apocalypse and are really dark and desperate. They fit perfectly to the music! The production of "Forgotten Memories" is really well done, the sound is loud but clear, so that every single note can be heard. For my personal preferences I might have liked a different snare sound and perhaps a little more of “room”, but these are really peanuts and a question of personal opinions. The first track, Past Time Spirit begins with a black metal storm and really fast blasts. After a beautiful melodic riff, it's time for the first clean vocals. After a bath in different emotions and atmospheres, grunts and screams, the track ends again with a melodic riff that supports clean vocals. Puhh I must admit, making a review of this cd will be really difficult as there are so many elements in each song, that describing everything is almost impossible! So, let's go to the second masterpiece called Beyond the black Gate. This song begins with clean guitars, remembering me a little bit of Opeth in times of “Blackwater Park” (this is meant as a compliment guys!). Very deep, romantic and in the same time sad atmosphere! After that, we plunge in the middle of midtempo and slow riffs. After being thrown through grunts and screams, we end in a calm sea of clean vocals, supported again by a really good guitar melody. The third song Solaris begins with a groovy and catchy riff in death metal style. Here the drums do really good work, fit well to the atmosphere and support the ambience of this track! I must say, the whole song is very catchy, but at the same time the band doesn't renounce to technical virtuosity. The song ends with a spoken words riff, that gives a perfect end! Now we come to the instrumental song of “Forgotten Memories”. This track is named The Wanderer’s Song. The beginning reminds a little bit of Sepultura's “Kaiowas”, but is not as simply made. The toms do really good work and give the needed variation. I must say this song is good to take breath and to be ready to attack the second part of this really good work! So let's go!! We come now to Buried in a Labyrinth. At first we find a very smashy riffs, that animates the listener to bang in front of his stereo, but be careful! You’ll be surprised by the coming black metal storm and throw yourself out of the window if you aren’t prepared to it!! This really intensive black metal part transforms itself slowly in a midtempo riff and ends in an atmospheric melody in which both guitars give their really best!! After an intermezzo in clean vocals, we come again to the first smash riff and another riff that follows masters like Pestilence, Death or Cynic. After that the track ends again with a black metal riff. Now we come to number six Sovereign. A very dark guitar riff at the beginning and midtempo and slow rhythms are the characteristics of this piece, the end in a blasting black metal inferno, well done too!! Track number seven is Fallen Halls. Clean vocals with epic melodies do the beginning, beautiful guitar harmonies and sometimes blasting storms are put together to construct this song. Coming near the end there is a really good and well done guitar solo. In my personal opinion, the solo would need more volume and perhaps a little bit of hall or chorus, because it is really good and deserve to catch the attention of the listener in a more intensive way. Finally we are thrown in a very catchy death metal riff with an extraordinary rhythm section! Bang on!! The last song of “Forgotten Memories” is called The Unleashed Ones. The beginning transforms itself in an intense melodic and at the same time rhythmic riff. After that we come to a clean vocal part. After many rhythm changes and several black and death metal riffs the song finds slowly its end with clean vocals followed by another beautiful guitar solo. Resuming my impressions, I have to say that ENIGMATIK has done a really good job! The concept of the songs is not really simple to be followed, and the clean vocal parts seem sometimes a little bit thin, but these are only little things in which the band will surely improve in the next future. I’m looking forward to seeing them soon in the Z7 in Pratteln! Give them their well deserved chance! !